We wish there was a ‘one size fits all’ solution for casters. Life would be so much simpler if this were the case. Unfortunately, not all floors are uniform. Some floors consist of rubber matting and are frequently covered in debris. Others are covered in lush carpeting that’s kept scrupulously clean. You could use the same type of caster on both types of floor. You could … but you shouldn’t! The type of caster that runs smoothly on debris-filled, rubber flooring would soon carve grooves in your lush carpeting! Having the best performing casters depends on the choices you make, and the best choices you make are the ones where you are best informed … and this article is here to inform you! It’s part of our duty here at Douglas Equipment to make sure all our customers and potential customers are as well informed when it comes to choosing the best casters for their floor types. If you’re talking about using casters on carpets, then the chances are you’re talking about office furniture, and office chairs in particular. A huge number of employees now spend their working time seated all day, so it’s crucial that they are comfortable. This means they will need to shift the position of their chair on a frequent basis, which is why office chairs are caster-mounted. If you decide to purchase rubber casters or nylon casters on the end of your office chairs, then you are simply asking for trouble. In fact, such casters will simply dig into the carpet and stick fast. You might as well provide chairs for your office workers with no casters at all. The correct choices for casters to use on carpeted floors are metal or hard nylon. A metal caster or one made out of hard nylon will cut through even the thickest pile. Mobility will not be an issue, and caster tracks or indentations can be ‘removed’ at any time with a quick brushing. Mobility is important of course when it comes to office chairs and equipment, so a caster with ball-bearings is also a sound investment. Such casters roll more easily, even over surfaces that are not smooth. Finally, if cost is an issue and your carpets are low-pile, then you should be able to ‘get away’ with nylon twin wheels. 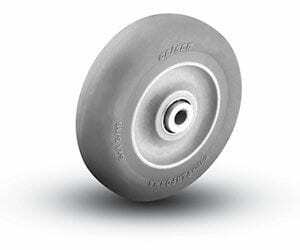 These types of wheels are not as expensive as metal or hard nylon casters, but they will perform just as well. Don’t expect them to perform on thick carpeting, though! There is one overwhelming reason why companies install hardwood flooring – the good looks! There is no more handsome flooring finish than hardwood, especially a newly laid or just polished hardwood floor. On the other hand, there is nothing more damaging to hardwood flooring than poorly-chosen casters, so you have to be really selective when you make your choice. New hardwood flooring will not retain its super-polished look forever, but you can help prevent scuffing, marks, scratches and permanent damage if you make the right selection. If the objects you are seeking casters for are not too heavy, then nylon casters are probably the safest choice. Nylon casters are typically smooth and non-abrasive and are usually installed ‘ready polished’ so they will not cause any issues with your hardwood flooring. For heavier items, nylon casters will not be up to the task. For that extra level of safety, you really need to think about using urethane casters. Urethane and nylon look practically the same, but urethane has one added benefit – it is slightly softer than nylon. That softness means that urethane casters are much less likely to mark or damage your precious hardwood flooring, even when they are under reasonable levels of stress. Of the three floor types considered in this article, tile floors are generally the hardest. Tiles are usually made from marble, granite or some other kind of stone, and as such create a tough, hard floor. However, even the toughest materials are prone to damage if you make poor choices when it comes to casters. If you are already using casters on furniture within rooms that have tiled flooring, then you may wish to check that those casters are not already damaging your flooring. If your casters seem to be coated in a thin layer of very fine dust, then they need replacing. This ‘dust’ is actually tile material that is being removed from the surface of your tiles by the motion of your casters. The general rule of casters when it comes to flooring is ‘the harder the floor, the softer the caster.’ If you use hard casters (such as metal or hard nylon) on hard flooring, then you are simply asking for trouble. Not only will hard casters scratch and wear (and may even crack) your tiles, they will cause the floor to become uneven or unsightly over a period of time. So, when it comes to tiled floors your choice comes to down to the softer materials that casters are usually manufactured from. These materials include soft rubber, nylon, polyolefin, polypropylene or urethane. All these caster choices will maintain the brightness of your tiles floor without compromising on performance. Note that if you choose correctly when it comes to casters for your tiled floor, you should also be able to use the items of furniture on carpeted floors as well. However, as outlined above, soft-material casters are not the best choice on carpeted floors, as comfort and maneuverability will be an issue. When it comes to carpet, hardwood, tile or any type of flooring, it’s imperative that you make the correct choice. To make sure that you do make the right choice, contact us here at Douglas Equipment. We’re always happy to help, and you can rely on us for sound advice when it comes to selecting the best casters for your unique situation. You can contact us by phone at 1-800-451-0030 or email using our online contact form.